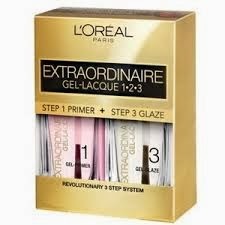 Last weekend I picked up all three steps of the new L’Oréal Paris Extraordinaire Gel-Lacque system. Steps 1 and 3, the primer and glaze, are sold together and retail for about $10 in mass-market retailers like Target and Wal-mart. The individual color bottles, like Lacqueriste shown in my swatch pic, retail for about $5. It appears there are 21 shades available right now. Most are core-type colors, just nice classic colors that appear to all be a creme finish. The primer is pretty thin, and reminded me of a rubberized basecoat like CND Stickey or Orly Bonder. The color applied nicely and was quite even in two coats. The glaze applied just like a topcoat. I tried the system last night and I waited about 30 minutes before I did anything with my hands after I was done and then went to bed about 2 hours later. I didn't experience any smudges or sheet marks, so I would say this dried nicely. I did not test this last night to see if it could be considered a quick-dry topcoat, because I wanted a perfect mani so I could do a wear test and see how it progresses over the next few days. I'm hoping this system is what I hoped CND Vinylux would be. Watch for a post on that soon- I was not pleased at all with the wear I got from Vinylux.